The Sorrel family has been active in Hermitage since 1893. The began planting vines in the Northern Rhone Valley in Hermitage shortly after the start of the 20th century, between 1910 and 1915. Marc Sorrel learned the wine trade from his father, Henri Sorrel. One thing to note, many of the bottles of 1989 Sorrel Le Greal I’ve tasted over the years has been corked. With that in mind, that might not be a vintage I’d purchase today. Marc Sorrel took over managing the domaine in 1982, following the passing of his father, Henri Sorrel. Today Domaine Marc Sorrel produces two Hermitage Rouge wines and two Hermitage white wines. Marc Sorrel Hermitage Rouge is produced from mostly vines located in the Les Bessards, Les Greffieux and Les Plantiers lieux-dits. The fruit is always destemmed. 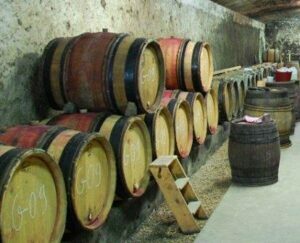 The wines are aged in used, French oak barrels for 12 months. Marc Sorrel Le Greal comes from vines in the Le Meal vineyard, on a terroir of steep hillsides with granite, limestone, sand and clay soils. Many of the vines, perhaps up to 90% are planted around the middle of the slope for the Le Meal vineyard which is a warmer micro climate than other parts of Le Meal. The wine is a blend of 95% old vine Syrah and 5% Marsanne, although the amount of Marsanne in the blend varies, depending on the vintage. It can be as high as 8% of the blend. The Marsanne grapes are planted in the Les Rocoules lieu-dit. The vines are on average 60 years of age. Some vines are even older. The grapes are whole cluster fermented. Following vinification. the wine is aged in used, French oak barrels for between 18 to 24 months before bottling. Not much wine is made as the production is close to 200 cases per vintage. Marc Sorrel Le Greal Hermitage is not made in every vintage. Marc Sorrel Hermitage Blanc is made from 100% Marsanne from vines that average close to 35 years of age. The wine is aged in used, French oak casks that are usually 3 to 4 years old. Marc Sorrel Hermitage Blanc Les Rocoules is produced from a blend of 90% Marsanne and 10% Roussanne. The vines are old at an average of 50 years of age. The wine is vinified in large, french barrels and is aged on its fine lees for a portion of the aging period. On average, the wine is aged for 18 months before bottling. The production is small as only 75 cases of wine are produced on average each vintage. For 2 vintages only, 1978 and 1979, the domaine produced a single vineyard wine from Le Meal. From 1992 until 1996, the domaine produced M Sorrel Hermitage Cuvee Classique. Domaine Marc Sorrel also produces red and white wine in the Crozes Hermitage appellation. Young vintages can be decanted for 2-4 hours, depending on the character of the vintage. This allows the wine to soften and open its perfume. Older vintages might need very little decanting, just enough to remove the sediment. Marc Sorrel Hermitage is at its best with 12-15 years of age, and can provide fabulous drinking for at least 3-4 decades. Marc Sorrel is best served at 15.5 degrees Celsius, 60 degrees Fahrenheit. The cool, almost cellar temperature gives the wine more freshness and lift. Marc Sorrel is best served with all types of classic meat dishes, veal, pork, beef, lamb, duck, game, roast chicken, roasted, braised and grilled dishes. Marc Sorrel is also good with Asian dishes, hearty fish courses like tuna, mushrooms and pasta. The white wine of Marc Sorrel is best served with a myriad of different seafood dishes, shellfish, crab, lobster, sushi, sashimi, chicken, pork and veal, as well as Asian cuisine. Wow, this is inky in color, with just as much depth in flavor to match. The nose shows crushed rocks, smoke and dark, black fruits. On the palate, the wine is incredibly full-bodied, rich and intense, with a hint of saltiness to the tannins. Even with all this power, the wine is balanced, fresh and refined. The best since 2003, and it is probably even better. It will age for decades effortlessly. Frightfully young, concentrated, full-bodied, tannic, fresh and holding on to its youthful, classic bent, the wine requires at least another decade in the cellar before all the grilled, smoked meat, beef blood, crushed rock and dark red fruits become civilized. This is a very strong wine, but patience is needed here. Just a super wine, inky, dark in color, the wine meshes a mountain of tannin with a wave of earthy, stony, crisp, ripe, juicy fruit. Here, the tannins are ripe, but they strong, so you need to wait on this baby for at least 8-10 years. White peach citrus rind, honeysuckle and crisp apple notes are combined with an oily, slightly honeyed, buttery, yellow and orange citrus character. Full bodied, intense, powerful, robust and refined, it's easy to find all the ripe, fresh, juicy blackberry, hints of blue fruit, smoke and licorice, with elements of crushed rocks. Long and expansive, another 5-10 more years will have this beauty singing. Light for an Hermitage wine, made from 100% Syrah, this is surprisingly forward, and open at just 10 years of age, allowing the soft, smoky, fresh cherry, earth, olive and earthy characteristics to come through. The wine has lift, but not a lot of depth. Round, lush, fat, dense, deeply colored, packed with rocks, ripe fruit, licorice, tannins and alcohol. A wine of pleasure that will be better in a few years. Shockingly young, in its dark color, and on the palate, which remains stuffed with ripe, dark fruits, tannins and energy. The wine gets going from the moment you sniff the peppery, dark red fruits, spice and earthy characteristics. The finish is long, fresh and loaded with peppery, vibrant fruits. This is good to go now, and should remain at this high level for at least 10-20 years. FWIW, I have had issues with bad bottles of the 1989, but at least this bottle of 1990 was clean.